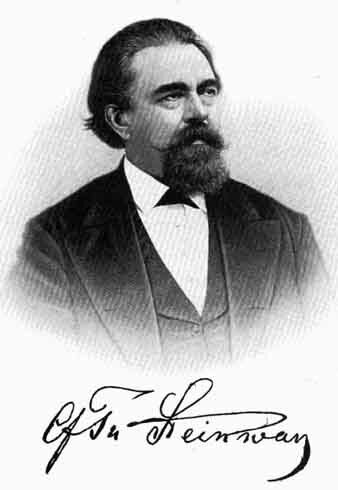 Henry Ziegler Steinway is the great-grandson of Heinrich (Henry) Engelhard Steinway, who founded the house of Stein way & Sons in 1853. After completing his education, Henry Ziegler joined the family business in 1937. From 1955 until 1977 he was its president, and since then has been a consultant to the firm. 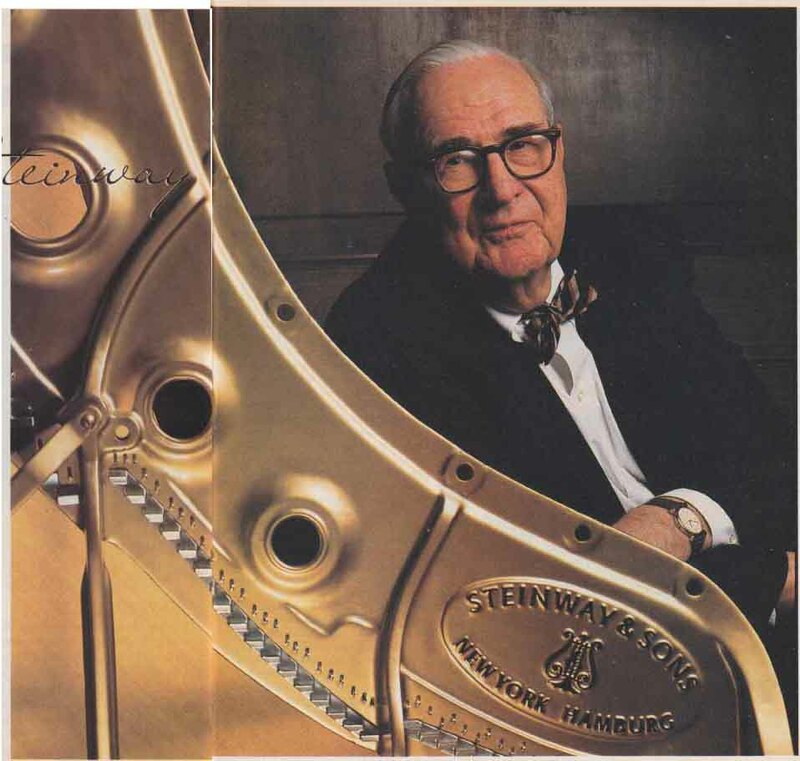 Steinway & Sons became a part of CBS in 1972, which held the firm until 1985, when it was acquired by a group of Boston investors. Here Steinway discusses his family’s contributions to the art and science of piano making, the nature and evolution of the “Steinway sound,” the artists who have performed on the family’s instruments, the character of recorded piano performance, and his views on the future of the grand piano in an age of electronic instruments. D.W.F. The Steinway family was obsessed with the idea of perfecting the piano using all available technology. 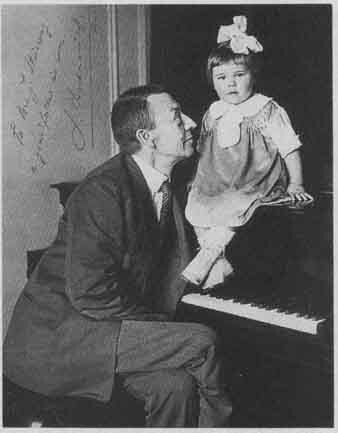 above: Rachmaninoff with one of his daughters, circa 1918. Your family has been involved in piano- making for more than 150 years. Could you tell us something about the influences your ancestors have had on music and pianos? You have to really go into the history of the house. The family left a small town in Germany and moved to the U.S. in 1850 because of the possibilities here. One of the sons, Charles, had come over a year earlier and had written to the family about America. Business conditions in Germany were very bad, let alone the political conditions, so the family pulled up stakes and moved to New York. They worked for other piano- makers, observed what was going on in the trade, and adopted good ideas of one kind or another. Since there were four Steinways, they could discuss things, think them over, experiment, and take what was good. They also introduced certain new ideas of their own. One of these ideas was the overstrung grand. They ran the bass strings over the treble strings and spread them in a fan shape. This allowed the moving of the bridge into the center of the soundboard for more volume and more powerful bass. They also developed a downward-projecting flange, which improved the geometry and fastening of the strings. These Steinway innovations were added to the existing idea of a cast-iron plate. Over the years, there were many other technical changes. What the Steinways came up with was a better piano. It actually sounded better, and they continued to experiment. Many authorities say that Steinway & Sons pioneered the modern piano more than 100 years ago. How were Steinways different from other pianos? The family was obsessed with the idea of perfecting the instrument and using whatever technology was available. 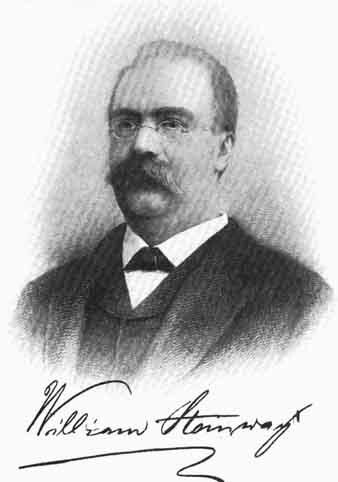 There was a period of about 35 years—ending just be- fore 1889, when Theodore Steinway, the eldest of Heinrich’s sons, died—when there was immense creativity in pianomaking. Basically the modern piano was developed during this time. 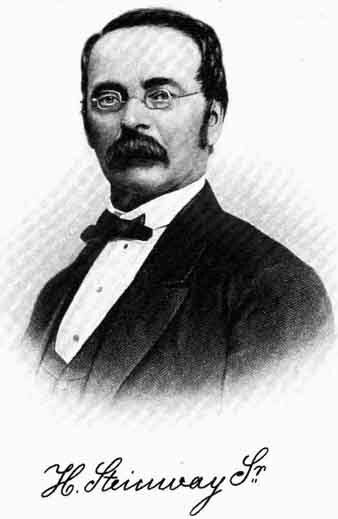 You’ll notice some of our early patents by Henry Steinway, Jr., who was sort of the engineer until he died in 1865, are action patents—improvements on the basic Erard piano action. Sébastien Erard [1752 to 1831] of France, who was originally from Alsace, invented the double escapement action. It was improved by Henry Steinway in several ways and continued to be developed by Theodore Steinway into what we think of as the best way of transmitting the player’s touch to a hammer being thrown against the string. When did that action development reach its maturity? I would say it reached its maturity some where in the 1880s with the development of what we call the Tubular Metallic Action Frame. The whole wooden action sits on a frame with what was at that time the latest technology: A seamless brass tube into which a hard maple dowel was inserted. The tube was soldered onto a bronze frame, and then the action parts were mounted on that. This system stands the test of time. You can take an 1875 Steinway with this metallic action frame, mount new parts on it, and it will work fine. What was the advantage of having the composite construction of the brass in addition to the metal? It was to keep the wood from moving. Wood always moves; it swells and shrinks with the season. The brass tube seems to hold it so that the dimensions stay fairly close; the whole idea, when I say “best” and “quality,” is to make the thing stand. A Steinway piano must be durable; it must last and last and last. It must also be easy to fix, easy for the workmen to service for those who really want to keep the piano up to standards. So 120 years ago Theodore Steinway was designing for easy maintenance? Absolutely. I think that was true through out the instrument. You can see it in the design of the bent rim, which again was an example of innovative technology. Every body could bend wood, but they didn’t know they could bend things the size of a piano rim. 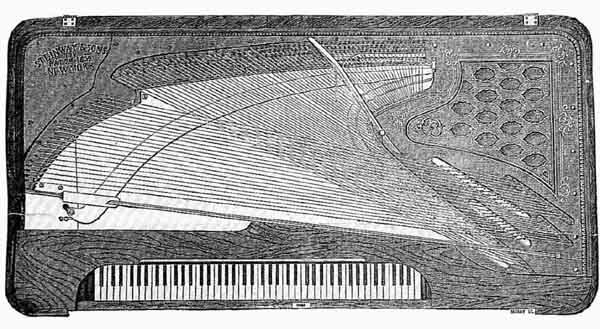 Theodore developed a system to bend thin, 1/8” strips of wood around in the shape that is now considered the standard shape for pianos. Before then, furniture. This made the whole structure different. Instead of having a thick bed like the square pianos had, a 2- or 3-inch bed of spruce, the new pianos could just use bracing; then the iron plate goes in, and it makes a “form follows function” kind of structure. Theodore developed the design, and almost everyone builds grand pianos that way now. above: Sold in 1853, these “square” instruments made up 95% of Steinway’s early output. 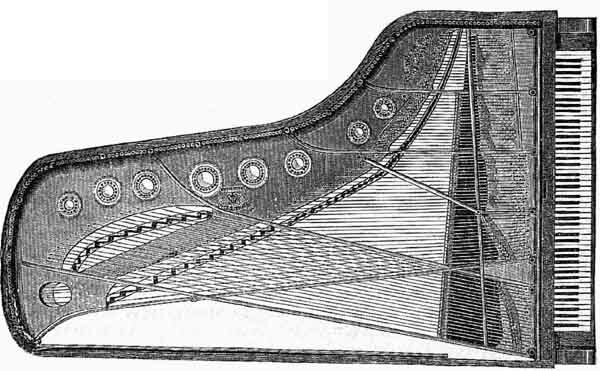 above: In early Steinway square, showing the over-stringing of the bass and the string fanning. In the front of the piano is a big, solid keybed. Theodore went to great lengths to try to keep it from swelling and shrinking, because the grand action not only has to go the pianos had jointed corners in them, like in and out to be serviced, but when you hit the soft pedal, it has to slide enough so that the hammers hit two strings instead of three. The soft pedal can get in bad shape if you don’t have a real solid structure. Theodore worked out a way to do that too. 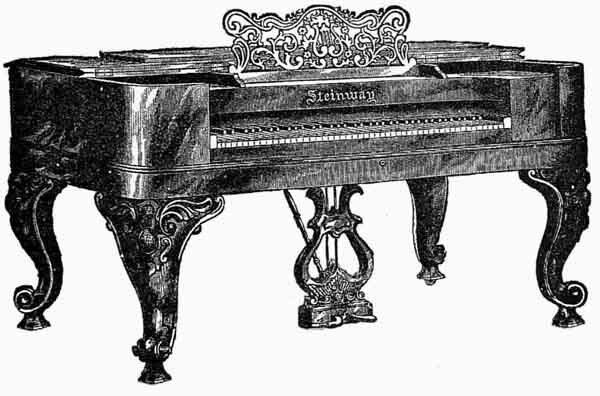 above: The modern grand piano, as shown in a Steinway catalog of 1888.
above: Over-strung scale as used in upright pianos in 1862. Looking at the history, it becomes very clear that Steinway had close relationships with famous artists—Paderewski, Rubinstein, Hofmann, Horowitz, and many others. It’s also been said that about 90% of all piano concerts today are played on Steinways. What is the company’s relationship with artists, how does each benefit, and how has the relation ship changed over the years? Well, it all started, I believe, with the fact that we called on artists for help in the design of the piano, and still do in many ways. If there is some little refinement or improvement, it’s put in a concert grand and used in our concert department. We see whether artists pick it or not and what comments they make when they try it out. More than 130 years ago, William Steinway saw that there was tremendous advantage in having the Steinway played on stage by an artist. So he started to furnish pianos to artists and to compete with Chickering, which was then the big name. What actually happened was that between Chickering’s efforts and Steinway’s, pianists no longer had to bring European instruments with them when they played in America, as they had done in the 1830s and ‘40s. This became a very important promotion for Steinway and created an acknowledgment in the public mind that Steinway was equated with “best” when it was played on the stage. In those days they had a large “Steinway” painted on the side of the piano, and the other makers put their names on the side too. Pianos were furnished to opera companies, symphonies, halls, hotels, and artists. I have to mention people not named Steinway who were important. There was a man named Charles F. Tretbar who was hired in 1865 as a confidential assistant to William. He really had a lot to do with developing the shape of the concert business later on. Steinway & Sons built Stein way Hall in 1866, a large concert hall on 14th Street with 2,500 seats. It soon became a center for music in New York. The Phil harmonic performed; there were vocal concerts, organ concerts, chamber music performances, all kinds of things. There were other cultural events also—readings by Charles Dickens, speeches, and scientific lectures. The first performance of music over wire was heard in Steinway Hall. Somebody played a special instrument in Philadelphia, and you could hear it in New York. This was in 1877. The instrument was invented by Elisha Gray, who was Alexander Graham Bell’s big competitor. It used organ reeds and electromagnets, and to make it louder they set the instrument on a Steinway. Musical life in America was not very great. To have a few pianists come from Europe once in a while and play was not good enough, so Steinway started supporting artists, mostly European although some American, sponsoring their tours in the United States. There were two “biggies,” as far as Stein way sponsorship was concerned. One was the decision to bring Anton Rubinstein over here in the season of 1872 to ‘73, when he played something like 218 concerts all across the country. It wasn’t, of course, just large cities they played in those days. They played in places like Deadwood, South Dakota, because it was a big mining town with a big audience. Rubinstein was brought over with Henri Wieniawski, the violinist, because the country was not yet ready for solo recitals. Rubinstein brought good piano playing to this country. He was one of the first who played all kinds of repertory—not just works he composed—and he showed what the piano could do and how it could sound. The next big one was Ignace J. Paderewski in 1891. In between there were a lot of people who have been forgotten, like Mehlig, Essipoff, and Joseffy. We don’t have complete records of this. 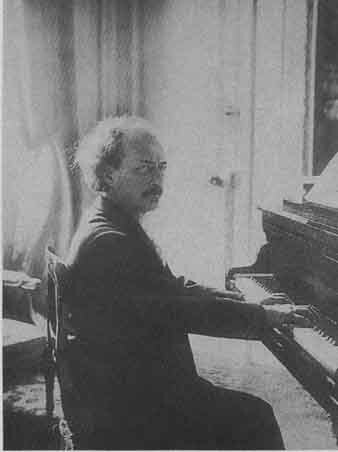 William Steinway decided to bring Paderewski over for the 1891 to ‘92 season, and he was an enormous success. He is the Babe Ruth of piano players. Suddenly something took fire. He was handsome. He had a head of blond hair, and all the ladies were crazy for him. By then Steinway had a good network of dealers who knew how to popularize this. Of course, Paderewski ultimately travelled in his own railroad car. Steinway would provide three or four pianos that would be shipped American Express, leapfrogging pianos from one city to another. Paderewski was just remarkable. Today’s Steinway artist is someone who chooses to play a Steinway wherever his or her concerts are. At the beginning of the season, the manager will give Steinway a list of the locations where the artist is going to play. Steinway will inform its dealers. Each dealer has in his store at least one Steinway concert grand that belongs to Steinway, that the dealer will service the artist on this date. (That means in places like Chicago and Los Angeles, there are several Steinway concert pianos.) At other times the dealer can use the piano for local artists. The artist or the sponsor, depending on how his contract with the management reads, is charged for the transportation to the hall and back again and for the tuning. That’s the relationship between Steinway and the artist, and it’s something that we’re very proud of. Another important artist was Josef Hofmann, who in many ways is the ideal. He was a pianist’s pianist. Not that he wasn’t popular, but he didn’t promote himself like Paderewski did. But Hofmann could play the piano, in the opinion of several people, like nobody else could. He brought the tone out of the piano. Oh, yes. I heard him when he was old and I was young, and he was remarkable, no question about it. There were others, though. People like Rachmaninoff, another Steinway artist, who was really a composer but also an extraordinary pianist who had to support himself by piano playing. That’s why he did it. You mean that he couldn’t make enough money from his compositions? That’s right, composing couldn’t support him; he had two daughters. He could make a lot of money playing piano, so he’d regularly tour. In fact, he died while he was on tour in California in 1943. People always ask, “What was Rachmaninoff’s favorite piano?” He didn’t have a favorite piano. None of these guys did. They expected Steinway to have pianos that were ready for them to try. They came to our famous—or infamous—concert basement, where we had 20 or 25 pianos. They would try them and say, “I like this one and this one and this one.” If it was an important guy, like Arthur Rubinstein or Vladimir Horowitz, we’d set the piano aside for him for the season. 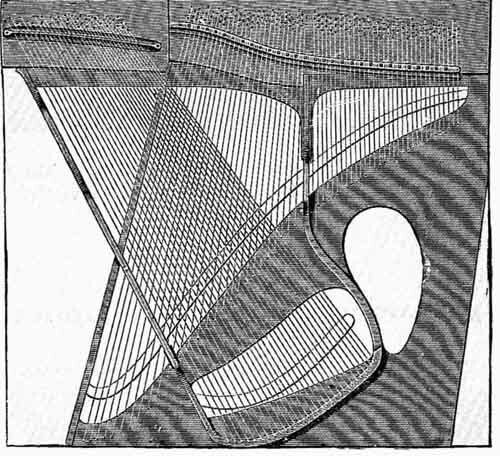 above: Cross section of a Steinway grand. When they were younger, they would all say, “I can play anything, I can adjust,” but as they get older they want the piano they’re used to. Horowitz is the extreme case. He insisted on taking his own piano with him everywhere, including to Russia on his last tour. We had to take his piano and send Franz Mohr, our chief technician, along with him and make sure that he felt happy when he got to Russia. But that’s more or less an exception. The journeyman artist (like Leonard Pennario, whom I happened to see the other day), has been playing for 50 years in concerts all over the world. His manager gives him the standard arrangement, and he’s happy with it. But he’s not always happy; sometimes an artist hits a bad piano. Then it’s up to our people to do something about it. Could you tell us a little more about that famous basement in the second Steinway Hall, on 57th Street? Well, Steinway’s concert department as it is now constituted has around 200 concert grands that are our property, which in dollars is a rather large investment. Again, a Steinway dealer must have at least one concert grand available, for which he pays us an annual fee. While they have to maintain that piano, they can and should use it for all kinds of local events. We want our dealers to be involved with the musical life of the community. To use an example, here in New York our concert department services about 2,500 events a year. That’s not all Pennario at Carnegie Hall; that’s anyone who wants a 9- or 7-foot grand. They can call and Steinway will furnish it for an event. There are 2,500 events a year in New York alone? Yes, individual services. The piano goes out of here, has the legs knocked off and goes into the truck, is hauled somewhere, and is set up. The technician goes and tunes it, and the next day it comes back again. That’s the basics of concert service. At the same time, a Steinway piano is stationed, as it’s called, at each of the major halls here in New York. And the dealers station pianos in some of their major halls around the country so that the artist does not have to call Steinway. Here, we suggest that an artist go to Carnegie and play the piano. “If you like it, play, if you don’t, come to the basement.” A younger artist who isn’t making that much can save a lot of money by using the piano that is already in the hall where he is playing. I haven’t really come back to the basement. When we moved here to 57th Street from 14th Street about 1925, the original conception was to have a concert department on the mezzanine. But for some reason, they decided to do the concert work out of the basement. And indeed they have since 1925 or ‘26. It’s a really nice- looking floor. It’s a cellar, all right. There are shops there for the retail service, and when we had our own trucking, we had locker rooms for the truck drivers. The concert basement itself has the 20 to 25 Steinways constantly ready for selection by anyone who wishes to come in, any artist, unless he has an affiliation with another manufacturer, because that’s just plain commercially silly. What are some of the things an artist will look for in an instrument? They look for a piano that they feel comfortable with and can use. All their fingers and hands are different; their musculature is different. I’m told that the way they play the piano is different. As an example, Rubinstein could not and would not play a piano that Horowitz liked and vice versa, because the way they played was different. And they could tell. Rubinstein would sit down and say, “No, this is a Horowitz piano. I don’t like this one.” It has something to do with the way they produced tone— how the key is pushed down, how it is released, and how much effort is needed. First, the action has to be even. Horowitz was a bug on having it absolutely even, and he could tell. I’d seen him 20 years ago when pianos were prepared for him, and he’d say, “No, this G is a little slow.” “Oh no, master, this can’t be so.” “Bring out the weights.” It was off, just a shade, and he could feel that. above: The Tubular Metallic Action Frame, circa 1885.
above: Steinway’s new repetition action, with patent tubular metal frame and metal standards. So he was sensitive to action regulating? Very sensitive to action regulating. Then, on the other hand, tone is important. When you had pianos set aside, there would be one piano to play with orchestra and one that was better for solo. Why? Because you need a little brighter piano to “cut through the orchestra,” as they put it. But in solo recitals, when the artists are in total command, they can have a piano to evoke the tone that they want. Pianists are really fascinated by that. I should mention that the concert grands, although a Steinway is built as durably as possible, have a normal life of somewhere around 10 years. The problem is due mostly to temperature changes. They have to go in a truck whether it’s hot or cold. Then the piano goes into the hall. The halls are pretty good now, but in the old days, sometimes they were freezing cold. The heat was turned on two hours before the concert. The change in temperature is not good for pianos. They get worn out, and we then replace them. This means that an instrument might spend a decade being trucked around to various venues in New York City? Yes. Sometimes they get dropped. We had some that were ruined at rock concerts. A couple of times they’ve shoved the piano off the stage, and it was broken. Once you break the plate, it’s just junk. I’m fascinated with your comments on the distinction between a piano that Horowitz would choose and one Rubinstein might choose. Could a mere mortal actually hear the difference? It’s very hard to separate out the touch and the sound in my mind. They have to find a piano they’re happy with. I don’t know whether it’s a hearing thing, a touching thing, or both. It’s got to feel right to the person. It’s not only the great pianist; most of our customers are people who play pretty well, and we hear some mighty good piano playing around here in Steinway Hall. It’s a mystery, this touch/tone thing. You produce tone by pushing down the key and throwing that hammer the last eighth of an inch against the string. People say it’s mechanical, but it isn’t, because you can hear the same piano played by persons A, B, and C and it will sound different. Each produces a different kind of tone. Whether that’s the silences between the notes, which certainly have an importance, I don’t know, but it’s there. 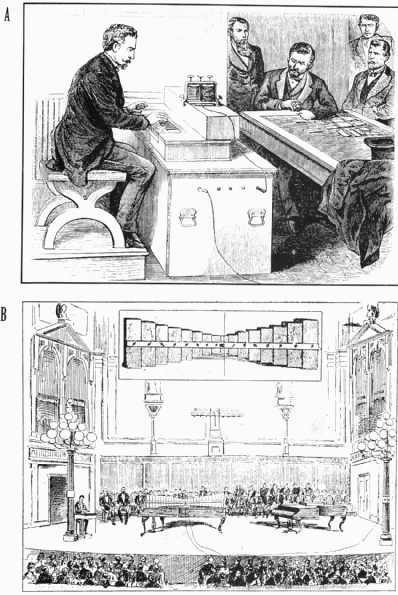 above: The first public transmission of music by wire was in 1877, from Philadelphia (A) to Steinway Hall (B). When you listen to a recording of a Steinway and listen to a Steinway in a hall, what differences do you notice? The performance on a record is always note-perfect because they edit. When you’re in a concert hall, there are some times mistakes and extraneous noises; an artist might hit part of the piano. Not really being a musical expert, when I go to concerts, the one thing I listen for is noises, the pedal squeaks. I remember going to a con cert where the bench was squeaking. It drove me crazy. If that was on a recording, they’d stop the recording right away and get a new bench. So the recording is always perfect, maybe too perfect. In today’s world, it’s the recording that sets the standard. Everybody learns music from records. The critics who write for The New York Times, the engineers, and people who are attracted to music, I bet most came from some small town and never heard a live concert until they were 15. I remember someone from The Times writing about that. He’d never been to a concert until he was 15 but had heard all the recordings. The generations before learned it from live performances. I’m not good at saying whether live or recorded piano is better or how they compare. But you seem to conclude that there’s an unnatural perfection to recordings. I wouldn’t say it’s unnatural. That’s the thing to do. Glenn Gould, one of the more fascinating artists in the world, was convinced that the solo concert was doomed. He may have been right, that recordings and electronics are the wave of the future. Earlier we talked about the differences in artists’ preferences for pianos. I get the impression that each instrument has a personality of its own. Yes, that’s true. I would say that’s the result of the handcrafted manufacturing. What makes it is hard to say. The final regulation brings out the tone, which they try to make as even as possible so that this note and that note at either end of the scale have the same sort of quality, but some pianos will be a little softer or harder in tone overall. More than that, the action of the keys varies as they are fitted to each other and inside the frame. There can be slight touch differences. The touch and tone interrelation is very hard to take apart. You have to get a piano that satisfies. Then there’s the whole area of the soundboard and how it’s installed, which, in my opinion, has a lot to do with the bigness of tone and the room you’re going to fill. How the board acts must in some way help determine the volume and quality of sound that comes out. Pianos have certain innate differences, and that’s good. Nothing in pianos is an exact science. You’re dealing with wood, where nothing is absolutely square. We try to build a standard piano, but everybody must pick out the one that best suits them. All the hand-fitting tends to make each one an individual instrument. People talk about the “Steinway sound.” What do you think that is? If you look at the organ business, there’s no such thing. There is no ultimate pipe organ. In violins, there are the Stradivarius aficionados and the people who like Guarneri. How much of Steinway’s reputation is in the eye and ear of the beholder, and how much is fact, is a little hard to say. But I think Steinway does have a certain unique tone quality. We’ve been talking about regulation quite a bit. It’s clear that’s a key determinant in the way the piano sounds. Could you describe what’s involved in regulation? What I’m talking about is what we call “tone regulating” and the English call “voicing” or “toning,” which is the final thing. But the first thing that has to happen is that a set of keys comes, and an action arrives from the action department. They have to be fitted to each other and to that individual piano. That’s the first of the steps and the first of the quality difference. When the first guy does his operation, known as fore-finishing, he’ll do, let’s say, a total of eight operations. Then the next guy will go over number five, six, seven, and eight and carry it onto nine, 10, 11, and 12. And then the next guy goes a little further. But they always are refining what’s been done before. That’s the process of action regulating. Part of that is the fitting of the dampers, which is very important. The dampers are the gadgets above the strings. The way the dampers move affects sound and silence. Silence is almost as important as sound in a piano performance. When the damper comes down, the tone has to stop, not ring or make funny noises. Then, when the piano is completely action-regulated and it’s been tuned three or four times, it goes to the tone regulator. His job is to then work principally on the hammers, which, up to then, are completely raw from the press. Usually the first thing he does is “skin it off,” as they call it. The tone regulator takes a piece of sandpaper glued to wood and pulls it gently over the tops of the hammers. He starts at the far side away from him—the back of the piano—goes up toward the front, and gets a clean felt surface. And the shape is important. It should be pear-shaped. All of this is done while the fallboard is out, so you have the keys and action exposed. The regulators make marks that indicate which notes are too loud, too soft, too high, too low. The keys by this time are all supposedly nice and even and weighted correctly. The regulators have to do this again and again, in and out, in and out. If the piano is too bright, they have to take it apart and stick the felt with needles, which releases the tension that’s built into the hammer when the hammer is glued together. That is the essence of the voicing and toning job that makes the sound nice and even. Incidentally, that’s why somebody who plays the piano fairly well should have a voicing done every fifth or sixth year, de pending on how much they play. After a time, the hammers get little grooves in them from banging against the strings. You really should have a good regulator—not a so-called tuner, but somebody who knows that branch of the business—come to give a regulating. Does a Steinway ever wear out? And besides regulation, what are some of the other basic things owners should do to take care of it? Most of the 500,000 Steinways built are still around somewhere, unless they were destroyed by fire or something. Like any mechanical device, a piano does get old, but it’s true—you can do remarkable things by the installation of new action parts and new felts and hammers. My opinion is that a lot has to do with how often the piano is moved. It’s really strange that a piano that goes into a home and stays there for 40 or 50 years may sometimes hardly need tuning. It’s really adapted to the environment it’s in. You can’t generalize about how long a piano lasts. It does have tremendous staying power, but, after all, it’s a mechanical thing. Over 100 years old, you’re taking a chance. You’re getting into a museum piece. That’s fine if you want to restore an 1870 Steinway. There’s one in the Smithsonian from 1870 that they have restored. It’s used in performances to show what an 1870 Steinway supposedly sounded like. For maintaining a piano, it’s good to tune it. The answer to how often it should be tuned is the question “How good is your ear?” Some people don’t mind if a piano sinks down in pitch if it does it evenly. Who can tell A-440 from A-338? If you can’t, you don’t need a tune. Steinway officially recommends tuning at least twice a year. When the heat goes on, give it a tuning; in the spring when the heat goes off, give it a tuning. But it really depends on people with very acute ears who play well. I don’t mean artists, I mean customers. Some will have it tuned every four to six weeks because it annoys them when it’s not at the right pitch. But no damage is being done if the instrument is allowed to go flat? No, in a way it’s almost good for it because no one has tightened up the pins or fooled around with it. As for other recommendations, depending on what people like, you can wipe off the finish. You don’t need any elaborate polishes. You should do what you want to; if you want to put Grandpa’s picture on it, go ahead. So it gets scratched, what the hell. It’s your piano. We recommend owners place it in a room away from the air conditioner or heater, but in modern houses the circulation is usually so good you don’t have to worry about it. There are people who will say that the old Steinways are better than the new ones. Some believe they’re easier to play or the tone is better. Are there real differences? Of course, there must be differences. Over the years we have made certain improvements and changes in materials. But I think there is a large emotional content in this. I started in the business over 50 years ago. Then, the “vintage” period for fine old Steinways was from around 1908 and 1909. As I got older, the period mysteriously moved up. It seems to be just like with the hot cars now; they’re the cars the 40-year- olds remember as kids. It’s the same with the pianos. The vintage period seems to move up to 40 years. I think this makes sense because people get fond of pianos. They’re a part of the family. 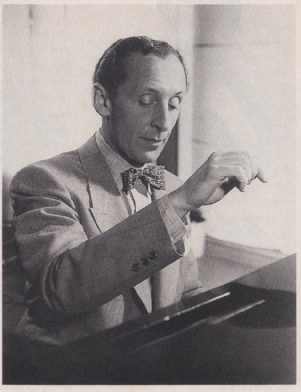 above: A young Vladimir Horowitz. 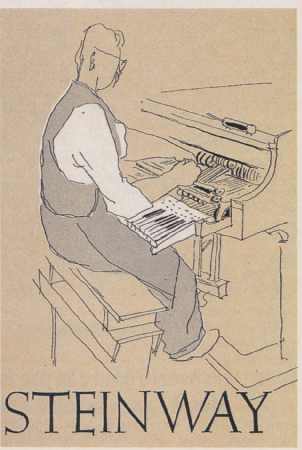 above: The voicing, or “tone regulating,” of a grand, from a 1948 Steinway & Sons catalog illustrated by Susanne Suba. So you take the view that it’s a changing fashion? Yes, I think it’s an emotional attachment to old pianos. When we used to do repair work, sometimes we’d get an old piano in with those ugly legs and we’d say, “Don’t you want to modernize it a little?” They’d say, “Don’t touch it. We want Grandma’s piano just the way we remember it.” There is an emotional content in piano owning. It’s an important purchase for any family. Another factor is that there is a large used-piano business—an enormous one. There probably isn’t a piano store in the United States that doesn’t have a used Steinway. The way to sell that old piano is to say, “This is from the vintage period.” The vintage period happens to be the age of the piano the salesman is trying to sell. It’s part of the mystique that people like, that it’s better if it’s old. You mentioned Horowitz as having an influence on the fashion in piano tone. Could we talk a little more about that? Horowitz came out of Russia in 1925 and played in Berlin first, I think. Berlin was a lot more important musically then than it’s been lately. It was, at that time, a music capital. He was a sensation because of his enormous digital skill and his brilliant tone. This brought in what was then a new style of playing, and many of the younger people tried to emulate that. Now, from what I hear, it’s going back again, and many of the younger pianists are seeking tone production again rather than brilliance. Someone mentioned to me, as a passing recollection, that just a year or two before Horowitz’s death, he himself was backing away from that brilliant, high-treble-energy tone. Do you know if that’s true? No, our regulator used to go up there all the time and do exactly what Horowitz wanted. I don’t know if his tone was changing. I don’t really see how it could. He was getting deep into his 80s and had this ability with his fingers all those years. I think his fingers were so strong that when he let the keys up and got beyond that little point where the hammer kicks back in again, he could give a full blow when the key was only halfway down. Not many could do that. He had a very quick up. Other people come up slower and bang it down again. Horowitz altered the fashion in piano tone? That’s the impression I get, but he wasn’t the only one. Rudolf Serkin burst on the scene about the same time as Rubinstein. Rubinstein really didn’t make a success in the United States until the middle ‘30s. He’d been here several times before, then he came back under the management of Sol Hurok, who is now no longer with us. Hurok was an old-time manager who really knew how to build careers. He told Rubin stein he had to play a Steinway and record with RCA Victor, which was a big thing at that time. Of course, they made this great success. Serkin had his own way of playing that was more like the old times, except that it was more musically deep, and some of his tone was terrible. He used to grunt and groan, and sometimes you could hear this. He had fat fingers, and he would play in a way I can’t describe. Horowitz, Rubinstein, and Serkin were all different. The younger people wanted to emulate them, and so we had more demand for brighter and brighter pianos. So the contemporary sound of the Steinway dates from Horowitz and that period? Yes, pretty much. They’d say, “Can’t you make it brighter?” and we’d make it brighter. There’s no question that electronic technology has invaded the world of the piano. There are computer-operated acoustic pianos, the Yamaha Disklavier the Bosendorfer SE. There are fully electronic instruments for the home, much smaller than the standard piano and cheaper and maintenance-free, more or less. These nearly have demolished the market for inexpensive traditional instruments. Steinway, though, seems to be above this electronic invasion. What do you see as the future of the traditional piano in general and Steinway in particular? That’s a very interesting thing. I’ve watched the electronics grow from nothing. The first ones appeared way back in the early 1930s. They experimented by putting a little pickup under the piano strings and amplifying them. The first experiments were done by Siemens in Germany, both with Bechstein and Steinway. I’ve seen an electrical Bechstein in the Berlin Music Museum. That was the first one. In the late 1930s, Story & Clark made an upright piano without a sound board and with a pickup behind the strings called Storytone, together with RCA. Do you know if that would have been a magnetic pickup? Must have been. A little square gadget of some kind. Everyone in the business laughed at this. Then the war came and nothing happened. After the war, the serious stuff started to happen. We now have to acknowledge that the electronic sourcing of music is here to stay, and there’s no question that it is the wave of the future. However, it would seem to me that there will always be a place for the acoustic piano among the aficionados who like to play music on it. Those people won’t be satisfied with the electronic piano, although it certainly has advantages. The most obvious for New York City is that you can use ear phones and not bother neighbors. And they’re reasonably maintenance-free; they don’t need tuning or servicing. But for Steinway, I feel, and I guess the new owners do, if they stick to their knitting and make a good piano, there will be a market.